Los Angeles, California - The sun broke through the clouds at the StubHub Center in Carson, California as gaffer Bruce Arena put the U.S. Men's National Team through the paces. New faces were given a brief opportunity to show just why they belong on the national team, and youngsters like Vancouver Whitecaps FC winger Kekuta Manneh have been given a chance to show what they can offer. Manneh was buzzing all over the pitch as he acclimated himself to his new surroundings. He had a smile from ear to ear as it was announced that his U.S. citizenship has finally been granted. A long journey with plenty of ups and downs. The news being so new to Manneh, that he has not yet found the time to phone his family in Texas to celebrate. "(I found out) very recently, just a few days ago," said Manneh. "It was exciting news. Something I've been waiting for, for a long time. Finally getting it was very exciting." 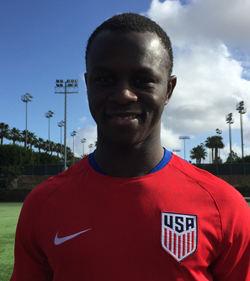 The 22 year-old Manneh will have to wait a little while longer to represent the United States in an official match. It could take up to two months for his FIFA player visa certificate to be completed. While he awaits that news, he dreams of his first match. "It would mean a lot, it's a dream come true," admitted Manneh. "I'm just really excited to be here. If I get a chance to play, it would definitely mean a lot to me." Manneh had to live in the U.S. for five years consecutive years to gain his residency status. He moved to Texas from his native Gambia at the age of sixteen. Once the Whitecaps drafted Manneh in the 2013 MLS SuperDraft, he began the long commute to and from his home in Point Roberts, Washington. He would travel in from across the Canada/ U.S. border to Vancouver for training sessions and matches. "No, I don't have to do that anymore," revealed Manneh. "I've got the citizenship now, and all that commute is over. It's back to Vancouver now." First impressions make a big impact and Bruce Arena has kept a close eye on Manneh. He doesn't want to rush him into anything too quickly, or bolster expectations. Manneh is coming back from a broken fifth metatarsal bone in his right foot. The July 9th injury has been a gruelling process of recovery. Arena knows what Manneh is capable of when fully healthy. "He's a good young player," said Bruce Arena. "He obviously missed a good part of the season, and he's returned from an injury. I don't think we're going to expect too much from him early. Hopefully he can through the next week healthy, and start showing what he's capable of doing. Obviously he's one of the players that had a difficult 2016 with his injury and he's a little bit behind the rest of the group right now." Veterans in the U.S. national team camp have also taken notice of Manneh. 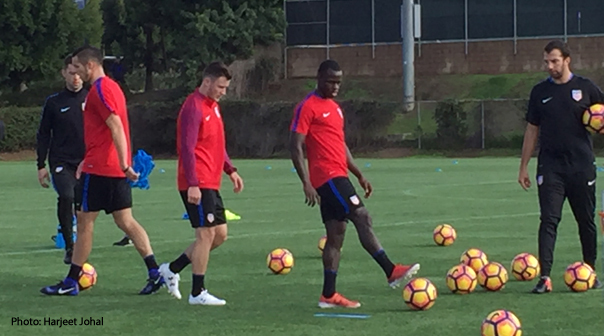 Jermaine Jones had his arm wrapped around Manneh as the U.S. players entered training. Toronto FC skipper, Michael Bradley, has competed against Manneh in several of tumultuous Whitecaps FC and Toronto FC matches. Bradley is excited to get to know Manneh better. "Playing against him in the league," said Bradley. "He's a guy who is very gifted athletically, in terms of his speed, agility, the way that he can put defenders on the wrong foot. I'm excited to be around him for a few weeks, up close." Not a lot of footballers get an opportunity to put on the kit of a national team. It's something players dream of, but only a few get the opportunity. Kekuta Manneh's skill set, work ethic, perseverance, and determination have helped him in an immense way. He's living proof that you don't always have to take the stack of cards dealt to you.